Ancient Easter songs, radiant in their simplicity, were the main source of inspiration for popular hymns of later times. And restores them to grace: unites them to holiness. From the pit of Hades. Early Christian hymns with similar thoughts were written by Saint Gregory of Nazianz and Bishop Synesios of Cyrene (about 414). Another hymn ascribed to Saint Ambrose is now used in the Lauds of Low Sunday: Claro paschali gaudio. An English translation may be found in the Protestant Episcopal hymnal of the United States ("That Easter Day with Joy Was Bright"). Venantius Fortunatus wrote (about 580) a Latin hymn, Salve festa dies (Hail, Festive Day!) which was later translated into various languages and became a popular Easter song. The first English translation is mentioned in a letter of Archbishop Cranmer to King Henry VIII, in 1544. An ancient hymn now recited at Vespers during Easter time is the poem Ad regias Agni dapes (The Royal Banquet of the Lamb). The present version, based on the text of a sixth- or seventh-century unknown author, was rearranged for the breviary under Pope Urban VIII (1644). "Thou Hallowed Chosen Morn of Praise" (Aute he klete kai hagia hemera). It is sung in the Greek liturgy during Easter night. A free English translation was published by John M. Neale in 1862; the tune for the English text is taken from a German melody composed by Johann H. Schein in 1628. "Sing All Nations" (Aidomen pantes laoi). An English adaptation ("Come Ye Faithful, Raise the Strain of Triumphant Gladness") was published by Neale in 1859. The tune was adopted from a German song by Johann Horn, printed in Nurnberg in 1544. "The Day of Resurrection" (Anastaseos Hemera) is sung in its original Greek text at the midnight service of the Greek Church, when the faithful light their candles before going to Communion. A free translation into English was written by Neale. It is sung to the tune of an old German Madonna hymn (Ave Maria, klarer und lichter Morgenstern) which appeared in 1784. From a German interpolation between the lines of the Easter sequence (Victimae Paschali) originated the famous hymn "Christus ist erstanden." (Christ Is Risen) which is sung to a tune dating from the year 1531. 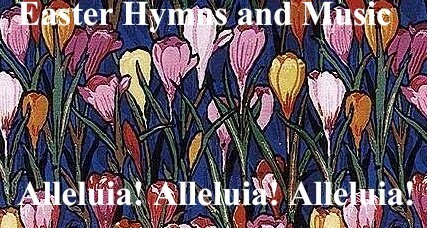 This ancient song is still the most popular Easter hymn in both Catholic and Protestant churches in Germany. It is intoned by the priest and sung by the people at the solemn service of Resurrection (Auferstehungsfeier) on Holy Saturday night. An English text was written by Isaac Watts (1748). Many beautiful Easter songs date from the later Middle Ages. A true carol is the Latin poem Alleluia! O filii and filiae (Alleluia, O Sons and Daughters), written by the Franciscan Jean Tisserand (1494) and first published in Paris in 1525. The earliest English translation (Young Men and Maids, Rejoice and Sing) appeared 1748 in a Catholic manual in London. The tune, composed by an unknown musician, was written in Paris, 1623. Another carol is the German song Wir wollen alle frohlich sein (Let Us All Be Glad), which appeared in a song book (Christlichs Gesangbuchlein) in 1568. Geoffry Shaw wrote an English text (Now Glad of Heart Be Every One). When death and Life did battle. Made death His knave and chattle. How death by death should come to fall. Now death is laughed to scorn. In a songbook for students published by the Jesuit Fathers at Cologne in 1695 appeared a Latin Easter hymn (Finita sunt jam proelia) that has become a favorite in many countries. An English text was written by Francis Pott in 1861. The modern tune was adapted from Palestrina's Magnificat Tertii Toni by William H. Mock in 1861. The sung of triumph has begun: Alleluia. There are many fine German chorales widely used in Lutheran as well as other Protestant churches. They number several hundred, and among them are some inspiring Easter hymns. The best arrangements of these chorales are found in the works of Johann Sebastian Bach. Raise your joys and triumphs high! Sing, ye heavens, and earth reply!